Adults and children playing together during the day of activities in Soacha. 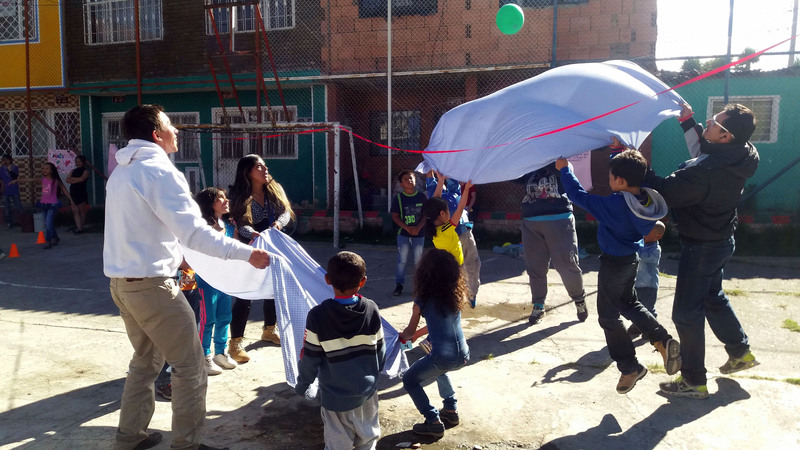 Through games based on human rights values, children from Soacha motivated adults in their community to share, reflect and take actions to encourage meaningful youth participation at home and in their community. July 28th, 2017 was a day to remember for the participants of the project Colombia al Derecho (Colombia Up-Right). 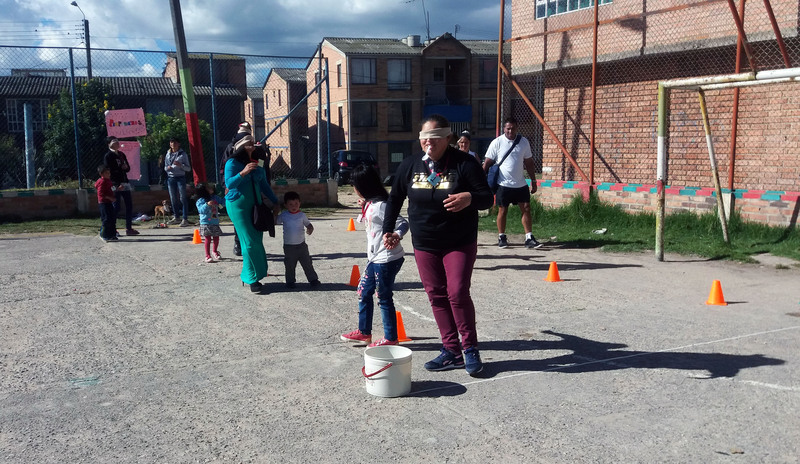 Girls and boys from Soacha, one of the communities where Equitas is present, planned and led an afternoon of games in their neighborhood to engage parents, caregivers and other adults in dialogue around children’s rights. The activities aimed to raise awareness about the importance of the participation and inclusion of children in community and family decision-making. More than 40 community members participated in this activity. A study conducted by Equitas and community organizations in 2015 showed that, in Colombia, one of the main barriers to the participation of children in decision-making is caused by attitudes and behaviors of exclusion against them due to their age and early life experience. Ensuring children and youth feel they can participate allows them to be aware of their ability to understand issues that affect them, such as violence, and play a key role in building more inclusive and equitable environments around them. Provided with space to lead actions and let their voices be heard, children of Soacha showed that progress towards positive social change is possible, and that children can take the lead. This child-led initiative was possible due to the support provided by community leaders from Soacha. During the acitivity, the space was set up in four playing stations aimed at promoting an exchange of ideas about trust, teamwork and solidarity between adults and children. At the end of the day, adult participants committed themselves to take concrete actions to change practices within their families, such as providing more opportunities for dialogue among family members and to take into account children’s opinions when decisions that concern them are been taken, rather than deciding for them. 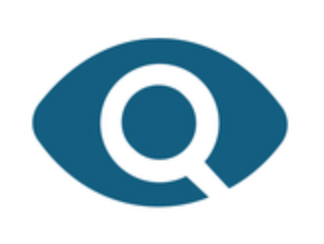 In a society where conflict has divided communities for many decades, human rights education plays a key role in transforming ways of thinking and conflictual practices. By building the capacity of community leaders to provide non-confrontational spaces of dialogue and to integrate human rights values into their work, we are enabling a positive change in their leadership role. More and more, members of the community — especially marginalized groups — can participate, speak up and be heard. In Soacha last July, it was the children who led the way!